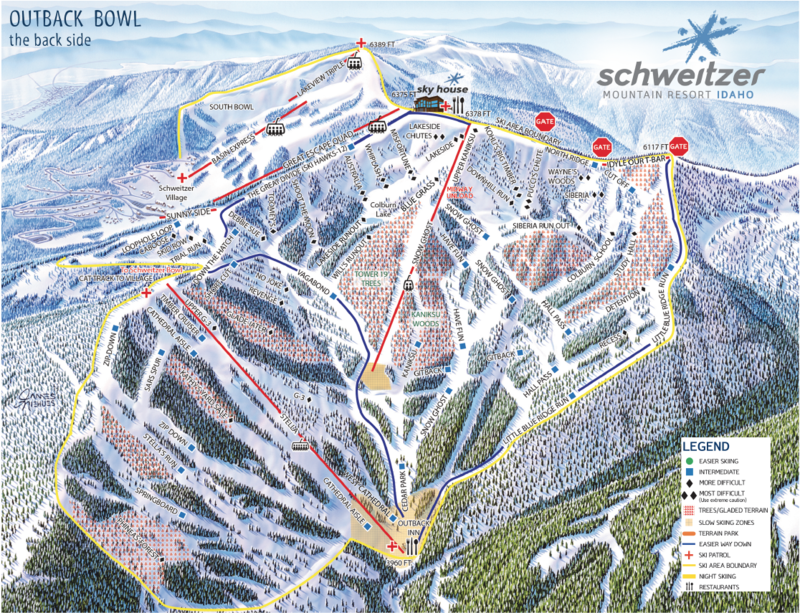 Outback Bowl at Schweitzer is currently serviced by three lifts, the longest of which will be replaced by two new ones in 2019. Pacific Northwest favorite Schweitzer Mountain Resort will replace one long double with two new chairlifts in 2019, says CEO Tom Chasse. The first lift will service the lower two thirds of the current Snow Ghost double, a 1971 Riblet with a 13-minute ride time. The second one will replace Snow Ghost’s upper segment, servicing the Lakeside Chutes in a new alignment topping out near the new Sky House restaurant. “We don’t have enough lift capacity right now,” Chasse told the Spokane Spokesman-Review. “We think it’s going to be a draw and will bring in more people.” The Bonner County Daily reported Schweitzer wanted to replace the nearly 2,000′ vertical lift a year ago but the $6-8 million project depended on financing becoming available. 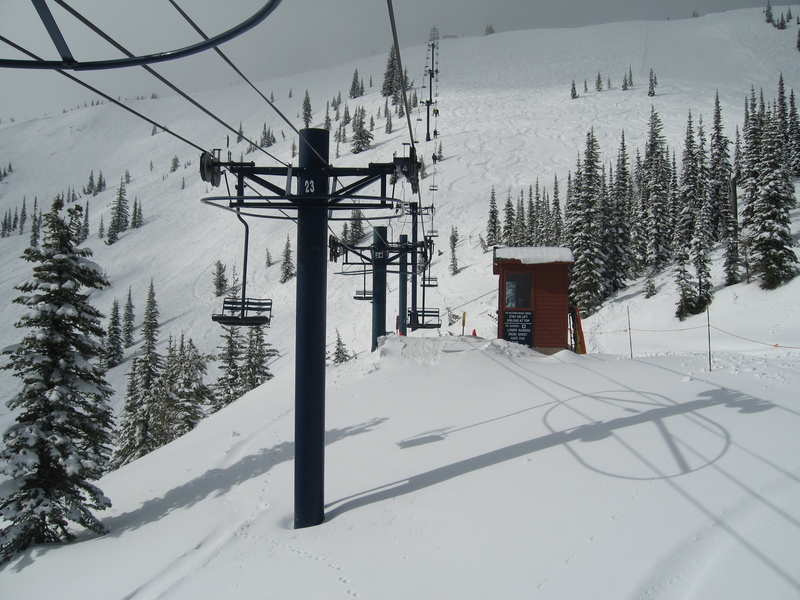 Schweitzer completed a project very similar to this one in 2007, replacing the lower section of Chair 1 with a high-speed quad and the upper section with a realigned Doppelmayr CTEC triple. Snow Ghost is a sweet lift but its time will soon come. Outback Bowl has a cool lift history. The current Snow Ghost lift used to be called Chair 6 and went from the very bottom of the bowl to the Siberia Runout. You can still see the old lift line in person and on the trail map. In 1987, the entire machine was moved to start and end higher with a mid-station added, leaving the lower part of Outback serviced only by Chair 5. That lift was replaced by a uniquely-themed six-pack called Stella in 2000. Schweitzer skiers can enjoy another season and a half of Snow Ghost but 2019 can’t come soon enough! No word yet on specific models or a manufacturer for the new lifts. Snow Ghost is a very unique lift , with a hydraulic drive driven Bullwheel..
A lift line at the runout would be unfortunate and change the character of the back bowl. Snowghost is perfectly placed now, just needs safer chairs, from a rider’s perspective. To me Snow Ghost chairlift is Not perfectly placed, and thank goodness Schweitzer is replacing it. The Lakeside Chutes should be left alone and chair free and one single chairlift should be installed. That chairlift, a modern high speed quad, should start at the Outback Lodge and base of Stella 6 pack rising right to the top of the current Snow Ghost Chair which is right their next to the Sky House Restaurant that this ski area is so proud of. This will put Schweitzer in a better place to draw more skiers to the area and release the huge cluster at the bottom of the Stella lift. No more six packs or even 8 pack chairlifts. Very Frustrating to get all the way to Stella base only to find a huge line and inefficient loading zone leaving spaces on chairs almost every time. Please do it right Schweitzer!